I headed west last week for a meeting with the Danish company Veksø, who produce urban furniture as well as the bicycle counters that featue in so many Danish cities, as well as international cities. There are 33 bicycle counters in 10 Danish cities alone. On the way to Fredericia - "Gateway to Jutland!" - the Intercity train stopped at a few stations, one of them being Middelfart. 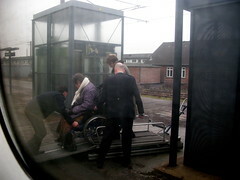 From my seat I watched three ladies in wheelchairs boarding the train. The conductor and a stationmaster worked quickly and efficiently to get each lady onto the lift, raise them to the level of the train and get them on board. 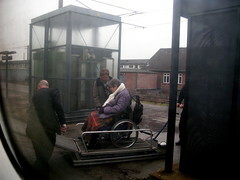 This is a major route that connects east and west Denmark, there are timetables to be kept, and still Danish State Railways take the time to get three passengers with special needs on board. It was impressive to watch. In a perfect world the platforms would be level with the trains but there are different models of trains - regional and national - so this isn't possible. 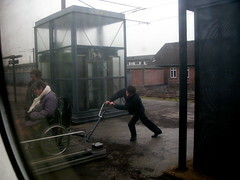 The regional trains I usually frequent are flush with the platforms making it easy to roll on roll off, whether its a bicycle or a pram or a wheelchair. 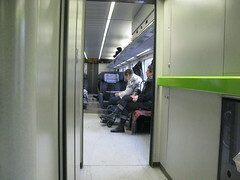 Once on board, however, it's just a question of leaning back and enjoying the ride. 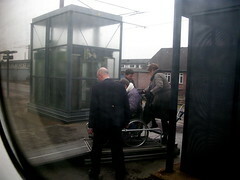 Getting a bicycle on board the Intercity trains is, of course, easy. The town of Middelfart has a special place in our family's history. My dad served in the British army after the Second World War. One of 2000 soldiers who are now referred to as The Forgotten Army (link in Danish). Danish men were encouraged by the Danish government to help the British army, now that Europe was liberated. There was still war against Japan at the time and the British needed men to get back home to work in the coal mines and factories, hoping to replace them with foreign soldiers. Over 20,000 Danes signed up after liberation in 1945. When they were later called up, however, only 2000 or so actually went to do their duty. They were never decorated or recognised by the Danish government upon returning home. My mother probably went into convulsions, never having heard such 'language' and certainly not repeated. My Dad and uncle were loving teasing her. Not a cracking, rolling in the aisles story in the big picture, but for our family, MiddelFART, plays its role in our storytelling. 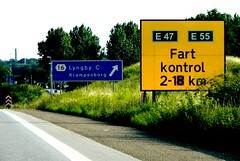 The question remains... do they have Fart Kontrol in Middelfart?